Powermat wireless charging stations will be introduced into 200 San Francisco Bay Area Starbucks locations, as the company plans to launch nationwide rollout before heading to Europe and Asia within 12 months. The chargers will be built directly into tables and bars inside of Starbucks, and the popular coffee chain hopes to win over patrons with the wireless charging offering. It was announced earlier this year that Starbucks was testing the wireless charging stations in the Bay Area, but trying to find them in-store proved difficult for many guests. The Power Matter Alliance produces the Powermat technology, and is supported by Starbucks, Google and AT&T. "The availability of Powermat Spots in Starbucks is transformative for San Francisco Bay residents who no longer have to worry about making it through their day with limited battery power," said Ran Poliakine, Powermat Technologies CEO, in a press statement. "They know that the nearest charge is only as far away as the nearest Starbucks." 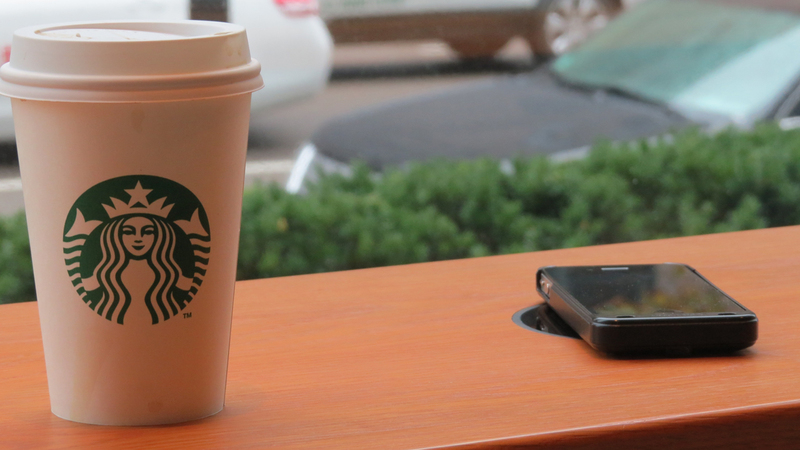 "We are thrilled to offer our Bay Area customers the next level of convenience with Powermat wireless charging," said Adam Brotman, Starbucks chief digital officer. "This first market installation is a first step towards a national deployment of this amenity in our stores."